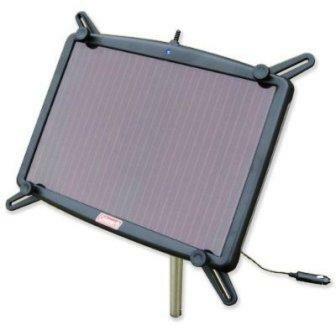 Description: This solar charger is designed to protect against natural battery discharge and electronic drain in RVs, boats, trucks, or mobile homes. What I Liked: For its wattage the panel works good for maintaining deep cycle batteries full charged. What Needs Improvement: Surely the global wattage output. The panel is not good for charging flat batteries or using it to power devices. Illuminated LEDs lets you know the panel is charging. In the package are included mounting screws. The charger is plug-in-play compatible for quick connections, and a cigarette lighter adapter and a battery clamp are also included with the panel. I looked around and this is a very good price for a solar charger of this wattage. As battery charge maintainer it works well. Battery looks to stay charged much longer with this attached. It produces small current in full sunlight that it can only maintain the existing charge of a battery. The ad copy clearly states “Water resistant” but the instructions state that it is not suitable for outdoor use. Share Your Thoughts: If you’ve bought the Coleman 4.5 Watt Battery Charger, tell us what you think. Thank You Steve, Your feedback was very useful and surely will help others to the right decision. Please can You share your solar array project? It’s a guide to calculate the power You need with a solar panel. I would like to use a deep charge boat battery to provide about 2-3 hours of light a day for my chickens. The battery would be running a timer all the time and 2-3 20 watt bulbs. What type of charger would I need? How much do they cost? A car headlamp is typically 60W, thats 5 Amps, a 12v flourescents is about 12w so therefore you need at least 1 Amp. therefore on a sunny day, its about 100W (uk) to 300W (asia) per square meter. Assuming the panel has a 5% efficiency, that makes the solar irradance between 5w and 15W per square meter (maximum possible), so if its perfect conditions you may get 4.5W. They say you get about 50-60% of the claimed power over a year, so lets take 50%, therefore 50% of 4.5W is about 2.25W. The reality is if you use this to charge your car battery, then you need to disconnect all the power cables onto the battery (because there is residual loss, eg clock, alarm etc), and keep it in the sunlight for weeks. To be realistic you need between 40 – 80 Watt solar panel to get anything usable.